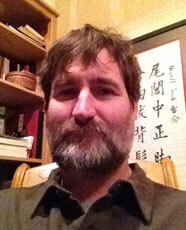 Jacob Newell has been practicing various arts of Chinese meditation & qi-cultivation for 25 years. He initially studied with Korean Zen Master Seung Sahn and spent a year in the late 1990's living at a monastery outside Tehachapi, CA. He has studied with numerous teachers of Taijiquan, most notably Masters Chen Qu Kuan of Taiwan and Frank Broadhead of Ukiah. Jacob is known for his softness and instinctive martial application in Taijiquan, however his martial interests in recent years have shifted toward the Russian Martial Art, Systema. Jacob has received certifications in Taijiquan, Qigong, & Acupressure, as well as Daoist ordination. He is a student of history and culture and has travelled to China, Korea, & Taiwan. His interests include Chinese language, poetry, divination, ritual, and calligraphy. He has translated several texts including the Dao De Jing, and he feels that a penetrating understanding of Chinese philosophy requires at least some exploration of Chinese language. Jacob writes extensively on Daoist philosophy & practice and hosts the blog: Daoist Blog of Nameless Stream. Jacob's root-teacher was Liu Ming, and his central practice is Zuowang, Sitting & Forgetting, in the tradition of Liu-family Daoism. Jacob teaches the view & method of Zuowang based on the transmission he received from Ming. Jacob's teaching integrates this contemplative meditation with traditional neidan (internal alchemy) symbolism and a keen sense of the energetic underpinnings of posture in both sitting meditation as well as the movement arts. His primary interest lies in the union of the "where is dust?" approach of Zen Buddhism with the "wuwei" teaching of Laozi and the gradual, transformative process of neidan. Jacob invites us to dive into the depths of the Dao De Jing and to apply Laozi's teaching to our lives in both formal practice & informal conduct. Jacob lives with his family in Santa Rosa and works professionally for a land conservation organization in Sonoma County.